None given thus far, probably because of how simple their names are. Oddly enough, I can't really describe them. I've done it often, but I can't really pinpoint WHO they are. Ehma: Playful, Forward, Kind and Compassionate. Zenor: Carefree, Forward(Except if women he likes are present, then he's more reserved and shy), Mischievous but Kind and Considerate. Oh man, how many times have I told this story? Alright, so, Ehma is the creation of Robert Robotnik. Yes, the last descendent of the Robotniks. He explained to her that he created her to boost the population of the past so that the 3rd generation of Robotnicks would be stopped from accomplishing the greatest success and failure: the Anti. The Anti is simply a virus which moves by air, drastically reducing any biological species' reproductive process. The world in which Ehma was brought in was a shell of it's former self, dark... Lifeless. Robert explained to her that she was the greatest thing any Robotnik could ever wish to accomplish. After 10 days of preparing his daughter for the time travel, he perished. He kissed her on the cheek, a tear dropping from behind his classes, he apologized to her for not being able to come with her and then left what remained human of himself. She may have been born for 10 days yet she still cried as if she knew her father a lifetime. After a brief moment of grief and giving her father a proper burial, she entered the machine he made for her to travel back in time, but it was her first time, so she accidentally only went back 150 years. There she met Zenor, Bliss, Kimari and Rebecca Robotnik, Robert's mother, which was currently pregnant of him. She then realized she had extensive knowledge of everyone who lived, except for Zenor. She knew everything except for a missing piece. Apparently he dissapeared at some point in time. So did his two friends. She then looked back in the time she was meant to go and saw their information, yet not their actions. That she offered everyone to come with her, They all accepted but Rebecca. She declined, saying she had a young one on the way. 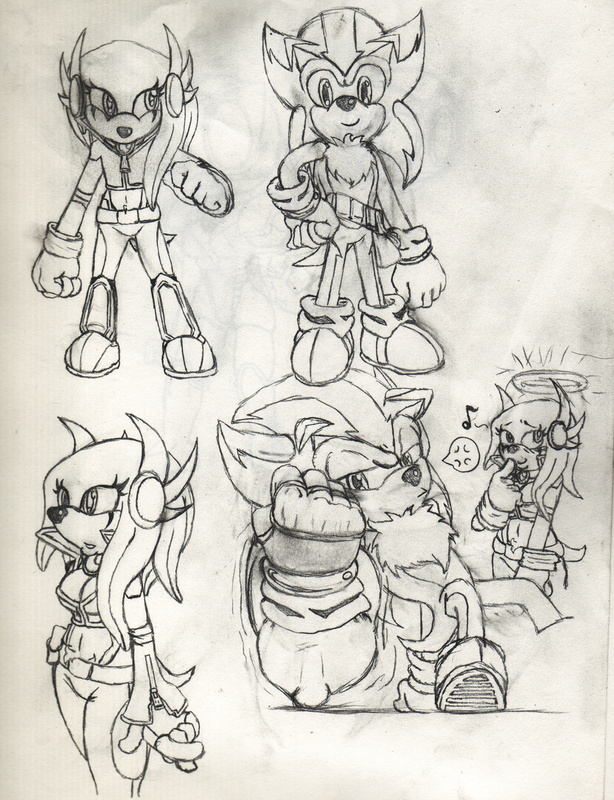 Ehma, Zenor, Bliss and Kimari traveled back in time to Sonic's era and ended up being greeted by Rebecca of all people. She explained that her older self came to mother Robert and told her to go with them. The rest of the story... Is to be told. Ehma: Robert Robotnik, son of Rebecca Robotnik. Believed to be based off of an android of old and an echidna. Both assumptions are false. Zenor: Believed to be related to Sonic because of the many resemblances. Assumptions are yet to be proven because of his Chaoskin bloodline, even if his appearance would tell you so. Visitors from the future trying to save the past. Best time to do that was Sonic's era. When history was made and the heroes' names were known until the end. As you can see Ehma goes flat and is completely analyzing every possibility when in combat/defense mode. HOWEVER, the moment she gets out of it, she needs to open her shirt or the shirt will rip... And she will get pissed if you cause her to rip her favorite shirt. In her combat mode, she can take out of her upper part of her legs a weapon in each leg. One is an EMP gun which she is the only material being who is immune to it and the other is a Stun gun. No... Not those crappy teaser guns which latch onto the target and you can zap as long as they are in the person's skin... This thing shoots electricity like a bullet to it's target. It also can turn into a Shock stick/sword, it can be a stick or unleash blades to make a sword. Yes, it is a GUN-BLADE! Now Zenor... Er... Well, simply put, he can run as fast as Sonic, but can move his arms as fast as his legs. He carries metal knuckle protectors so he can dig through solid rock if needed. Now if it wasn't for Ehma's Hormone Generator... That would be it. But she... Well, wonder why his arm is suddenly a monstrous muscle mass? That's Ehma's doing. She can target a specific part of a body, or target up to an entire building of people, and let Hormones do their work, making muscle grow, expand and do their thing. If she turns it off, the body will start to regain it's normal form from 30 minutes to 5 hours later. Long story short, when Zenor is "Powered up" he can smash and dig through metal like it's tin foil... Scary huh? In Combat Mode Ehma's eyes turn black, aqua and red. Black is the full extent of her front sight, she might be keeping an eye on you and you wouldn't know it. Aqua is the part has the X-Ray effect. As for the red... If it's on you, you better be covering your flaws or weak-points, she will find it, and she will use it. No, Ehma does not kill, nor break any bones or vital points, she only incapacitates.